Sparq’s revolutionary new microinverter, the Q1000, employs novel non-linear digital control strategies and an innovative power architecture to make conformance to future power quality standards possible today. Since 2012 smaller-scale solar electric PV installations have accelerated away from the use of conventional string-based centralized inverters in favor of implementing power conversion at the module itself. Implementations of the module-level approach are grouped into a class of inverters that are sometimes referred to as Module-Level Power Electronics (MLPE). Microinverters, which provide module-level Maximum Power Point Tracking (MPPT) and DC-to-AC power conversion are the extreme case. Power optimizers, however, perform module-level MPPT and DC-to-DC conversion and use a string-based approach to complete the DC-to-AC conversion at a centralized inverter. Both approaches offer some common virtues over the traditional string inverter, and each of the two approaches also offers specific advantages. 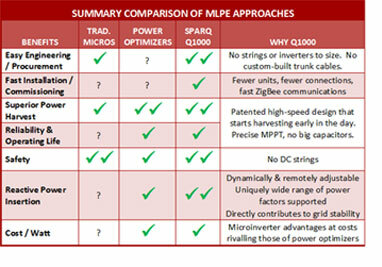 Sparq Systems is introducing to the market an innovative MLPE that not only combines the distinct virtues of the microinverter and the power optimizer, but also brings the revolutionary benefit of dynamically inserting leading or lagging reactive power at the grid edge. With DC/AC conversion localized to the PV module, microinverters completely eliminate high voltage DC cable runs. This provides a safer environment for installers, operators, and first responders when coming in contact with the PV array, as true automatic power shutoff is possible at the module level when the microinverter cannot sense the AC grid. Though power optimizers can rapidly shut down high DC voltage coming out of the array, loss of the AC grid or a fault at the centralized inverter typically will not disconnect the high DC voltages stored on the inverter’s capacitors. This stored energy must be discharged and may take several minutes to complete. During this discharge time there will still be high DC voltages present on the string wires and only after this discharge is complete is it safe to handle the DC connections. The localized DC/AC conversion also provides maximum design flexibility: systems using power optimizers still use DC strings to connect the optimizers to a centralized inverter; and to function properly, minimum and maximum string sizing must still be addressed during the design process. The number of microinverters that can be connected in series along an AC trunk cable is typically only limited by the current carrying capacity of the trunk cable and the size of the circuit breaker used to terminate the AC trunk cable. The minimum number of microinverters on any given trunk cable is one. Though some cost is added to the PV array by distributing DC/AC conversion, the microinverter approach eliminates a single point of failure for the PV array. If a microinverter goes offline for any reason, it does not impact the power production of the rest of the microinverters at the array. This contributes to higher system uptime over the life of the PV array. The power optimizer approach centralizes the DC/AC conversion at a single point, which provides some cost advantages over a microinverter-based approach due to the reduction in total DC/AC componentry deployed at a given PV array. The cost advantage is enhanced when considering that the DC strings use off-the-shelf PV wire, rather than the higher-cost, custom-made AC trunk cabling solution required by some microinverter-based solutions. Up to now, power optimizers have enjoyed a marginal advantage in Maximum Power Point Tracking (MPPT) over microinverters, in large part because power optimizers have not required the large capacitance used by microinverters to aid with power harvesting: the use of large capacitors reduces the dynamic response of the microinverter to sudden variations in power production by its connected PV module. Furthermore, large capacitors use materials in their manufacture that limit their practical useful life to well under the 25-year warranty that is typically offered with microinverters in the United States. Power optimizers are able to eliminate at least one risk factor to high reliability as a result of avoiding the use of such capacitors. Sparq System’s Quad is a four-port microinverter that maximizes power harvest for each of the four PV modules connected to it and converts the combined DC power contributions from each module into a single, smooth AC power waveform that is connected using an off-the-shelf trunk cable. The Quad combines superior architecture, patented energy harvest and power conversion technology, and wireless inverter communications to form a solution that provides benefits equal or superior to those offered by either traditional microinverter-based approaches or power optimizer-based approaches. Engineering: As with traditional microinverter-based approaches, engineering a Quad-based PV array is simple and straightforward: no minimum string sizes to worry about. Up to four Quad units can be connected along a standard 12AWG AC trunk cable protected by a 20-Amp breaker; and up to six Quad units can be connected along a standard 10AWG trunk cable and protected by a 30-Amp breaker. There’s only one inverter part number to order, whereas power optimizer-based approaches require proper sizing inventory management of the appropriate centralized DC/AC inverter unit. Installation: with one-quarter of the units required to service a given PV array, Quad-based deployments reduce installation labor costs tied to inverter mounting and AC interconnection. The power line-based communications approaches of many traditional microinverters and power optimizers mean that commissioning the system must wait until all wires are installed and connected. The Quad uses a highly-reliable ZigBee-based wireless communications approach to rapidly auto-discover and commission all of the installed units. This means that commissioning can be done on the fly as soon as modules are connected. Energy Harvest: Sparq systems has invented and patented unique approaches to both power conversion and high-precision MPPT and has applied those inventions to the Quad’s architecture and design. The result is seen through energy harvest that rivals or beats any MLPE implementation on the market today, without the use of large capacitors or remotely-installed centralized DC/AC converters. Reliability: Thanks to patented technology, the Quad possesses a sophisticated digital control architecture that gets the most out of small-form componentry that is specifically selected for its long life and ability to withstand the extreme temperatures seen in some PV array operating environments – no electrolytic capacitors and opto-couplers. The Sparq Systems’ engineering team has brought all of its deep experience from space, defense, and automotive power electronics design to bear in the making of the Quad. Cost: Reduction in the number of DC/AC conversion points lowers component counts and subsequently cost, to a level similar to that seen with optimizer-based approaches. The use of an off-the-shelf AC trunk cable provides additional savings over traditional microinverter-based approaches, which typically require two to four times the number of AC trunk connections to handle the same PV array as compared to arrays using the Quad. Power grids that enjoy a comparatively high level of distributed energy generation assets, such as Hawai’i, are struggling to address the potential threats to grid stability that independent distributed power production can bring. Chief among those challenges are (1) dynamic voltage support, (2) grid frequency stabilization, and (3) Fault-Ride-Through (FRT) capability. Up to now, the solutions available to the power utility grid provider have been to limit the further deployment of distributed solar electric systems, or to strictly permit only traditional, less-productive string-based centralized inverters on PV arrays. These same novel non-linear digital control strategies and innovative power architecture are brought to bear to improve power quality, an important objective in electrical power system design. Voltage variation from nominal values, waveform distortion due to harmonics, load transients, voltage flicker, fault-ride-through, frequency stabilization and voltage support are among the most important factors in designing the system. Particularly unique, however, is the Quad’s ability to fully control leading or lagging reactive and real power insertion onto the grid to help counteract the influence that other loads may be having in destabilizing the grid. Many such destabilizing loads can have effect on grid stability, so it is crucial that any localized insertion of both real and reactive power be remotely and dynamically controllable. The Sparq Quad’s remote management and monitoring system’s architecture allows utility grids to use the emerging standardized information models to dynamically adjust the insertion of reactive power from each QUAD microinverter individually, from up to rated VAR-leading through rated VAR-lagging per microinverter, and all points in-between. The Sparq Systems solution for providing module-level power electronics is a significant step up from traditional MLPE solutions, both in terms of its ability to safely harvest power from PV modules and its contribution to the overall stability of the power grid. Sparq has brought high-frequency digital control of resonant power conversion to bear in a manner that lowers the overall cost of engineering, installing, and operating PV arrays.